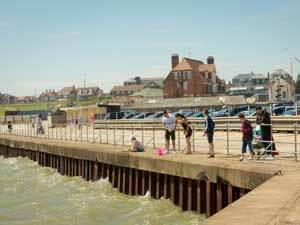 Tourist Infomation Centre Walk 18 at Gorleston Quayside and Town01493 846346work Walking RouteGorleston Quayside and Town Walk is a 2.2 mile (3.5 kilometre) circular walk starting at Brush Quay in Gorleston-on-Sea near Great Yarmouth. This walk explores the quayside and take in an number of historic and interesting areas as well as the RNLI Lifeboat Station and pretty Priory Gardens. There are a number of places where shelter or refreshments can be obtained along the route and there are public facilities available on Feathers Plain opposite the Feathers public house on the High Street.